Several Midland businesses and local organizations will be participating in a regional Veterans Recreation Day. 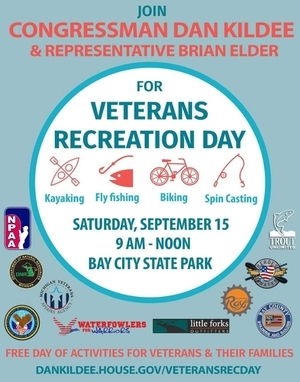 Put on by local Congressman Dan Kildee and Michigan House Representative Brian Elder, the event is promoting our local outdoor recreation resources as a go-to for veterans and those dealing with post-traumatic stress disorder (PTSD). Ray’s Bike Shop, Tri To Finish, Little Forks Outfitters, Cabela’s, and two local Trout Unlimited chapters will be joining Heroes on the Water and Waterfowlers for Warriors for the event. Heroes on the Water provides no expense fishing and kayak trips to veterans, first responders and their families and Waterfowlers for Warriors connects veterans through duck hunting expeditions. The Veterans Recreation Day on Saturday, September 15. The event will take over part of the Bay City State Park and run from 9:00 a.m. to 12:00 p.m. on Saturday, September 15. Businesses and groups will be on hand the entire morning showcasing kayaking, fly fishing, biking and spin casting demonstrations and activities. Representatives from several veteran administration and service offices will be on hand to further assist with access to information, resources and claim assistance. The event aims to reinforce that you don’t have to go far to enjoy outdoor recreation – it’s right in your backyard. Lunch will be provided and the event is also free for veterans and their families, as the DNR has waived the entrance fee for the park that day, in part as a gesture for local service members and to reinforce the therapeutic benefits of outdoor recreation. While Congressman Kildee and Representative Elder will be on hand, veterans across the state are encouraged to reach out to their local congressional offices for information and support. Offices across many regions work together to provide veterans with resources and support. If you, or someone you know needs resource support, reach out to one of your local representatives.